You are the visitor since start of website on 01 june 2008. With this part you can select a Route from the points given on a Google map overview. Moving over a yellow dot on the map will show the Route name in a textballoon. Click on the RouteName in one of the two right columns to show the Route on a map or to download the Route as a Zip-File containing the GPX-Route-, GPX-Track-, KML- and HTM-files. With this part of this site it is possible to Draw and Download Routes for HikeTrips and BikeTrips on a 'Google map' or a 'OSM Map'. Then you can save the Route-data as GPX-Route-File, GPX-Track-File or as KML-File. First you can Center the shown map by entering a Location, Place, City or Country... and press 'Search'. The map will now center on the given location. Then you should press the 'Start Draw RT'-button to begin the drawing of a new Route. Each next click on the map will store the related coordinates as Latitude and Longitude. With the 'Undo Last'-button you can remove the last drawn route line. With the 'Edit Route'-button you can edit, change and move the drawn route lines. Click 'Stop Edit'-button to end this edit action. You can add now again more route lines. Click the 'End Draw RT' button when the drawing of the Route is finished. Now you can choise to save the route as GPX-Route-File, GPX-Track-File or KML-File. It is also possible to copy the Route as GPX-Route-File, GPX-Track-File or KML-File into the clipboard. GoogleEarth can be free downloaded here. The GPX-code is a common protocol to interchange GPS-data between different devices and computers. The GPX-file can contain: Waypoints, Routes, Tracks. A Waypoint is an interresting Point on a map. Each Waypoint is located by a Latitude and a Longitude. A Route is a predefined path indicating how a trip must be made. It gives the way to be followed on a map by means of successive Waypoints. A Route can also contain a Name, a Description, a Comment, ... and the successive Waypoints to be followed. 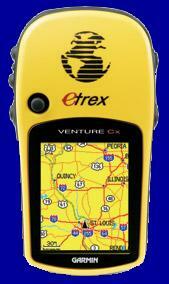 A Track is generated by the GPS-Device itself (options to be configured by the GPS-settings). A Track gives the passed way as Waypoints of a made Hike- or Biketrip. The interval of the Waypoints can be configured as time related or distance related places. Each Waypoint in the Track can contain the coordinates, the time, the height.... of the passed point. The specification of WayPoint, Route and Track can be found here. All used GPX files are tested on the 'Mapsource' program, with the 'Garmin Etrex Venture' GPS and also with the 'Garmin Oregon 300' GPS. All used KML files will load on the 'Google Earth' program ver 4.3. All used HTM files are running on Internet Explorer version 7.0.5730.13. - Position the map with the arrows on the upper left. - Position the map also with dragging the mouse off target a Red Dot. - Scale the map with the scale-tool on the left. - Scale the map with a double Right or a double Left mouse click. 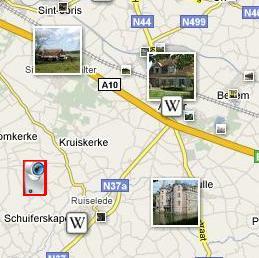 - Change the view with buttons 'map', 'Satellite', 'Both'. Last website update on 10jan2018.